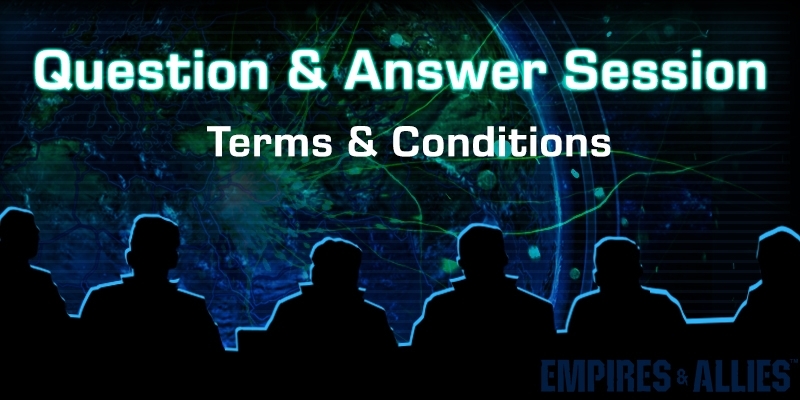 We look forward to your participation in the Empires and Allies Q&A session, however, please carefully consider the following rules and regulations. Please read them in full before posting, by participating in these discussions, you agree to be bound by the rules and regulations. “Empires and Allies Commanders, shoot your Questions” post will appear on E&A Community/Social Media pages/handles on the 10th of June, 2018 at 8:00 am (PDT) indicating that we’re open to receive your questions for the next 24 hours. Your questions must reach us before the 11th of June, 7:59 am (PDT). We will not entertain any questions that reach us after the given time mentioned before. All Questions and Answers are to be asked and answered in English only. We apologize for any inconvenience this may have caused and we want to thank you for your continued patience and understanding. Note that team Empires and Allies, administers the right and discretion to NOT answer any question depending on its relevance and privacy policies.